A scholarly history examines the academic and cultural derision suffered by the Midwest, calling for a return to a healthy regionalism. At the start of the 20th century, the Midwest was a tableau of robust health economically, culturally, and intellectually. But an unfortunate alliance of forces conspired to reduce it to a shallow caricature, a backwater of blinkered provincialism. Lauck (Daschle vs. Thune, 2016, etc.) links the decline of the Midwest’s reputation to several intersecting factors: the rise of mass culture and globalization, the unpopularity of isolationism, the ascendency of Marxism and the fashionableness of a certain kind of cosmopolitan skepticism, and even misgivings about Christianity, all contributing to a pervasive cynicism about regional values. The author assesses the so-called “village revolt,” the critique forwarded by disaffected Midwestern writers and intellectuals, and exposes that narrative as simplistic and one-sided. Lauck investigates the reasons for the lack of attention devoted to the Midwest by historians, a deficit that contributes to an impoverished view of the country’s trajectory. The author also sketches a vision of what a rehabilitated emphasis on Midwestern history would look like, one that includes minority perspectives too often disenfranchised and searching reflections on the effects of 20th-century currents like agricultural mechanization and urbanization. Finally, Lauck argues for the reinvigoration of regionalism itself, which he believes will politically and culturally strengthen the nation: “If a regionalist consciousness is to dampen our cynicism and bolster community participation and the rudiments of democracy in places such as the Midwest, however, the elements of regionalism must be revived and brought to a broader audience.” Lauck’s study is both concise and meticulous, carefully considering a dizzying wealth of scholarly and literary resources (he offers extensive notes). His writing is always lucid, if dryly academic, but beneath the rhetorical patina of scholarly prose one can’t help but detect a genuine passion for the subject (the author is Midwestern). 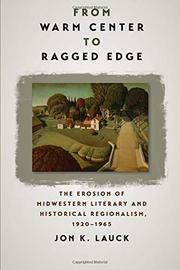 Lauck hopes that the stories of regions like the Midwest will be heard again, “not as distant echoes from the ragged edge, but in the form of rooted voices from the solid center of the nation.” At its core, this work is a timely appeal for a reconsideration of unrestrained cosmopolitanism and a compelling argument for the cultural vitality of an unjustly neglected—and maligned—sector of the American republic. A philosophically astute defense of regionalism’s virtues.